How much? I asked incredulously. It was fitting-out time, my boat was hauled for bottom paint, and Id asked a little sail loft near the boatyard to give me a quote. I wanted a set of lace-on weather cloths to protect the back and sides of my bridge from the breeze that sometimes whipped through there. For the amount I was quoted, I could have built them from solid teak. I pondered this while looking at the professional canvas work on other boats, and realized there wasnt anything terribly difficult about the task. Nearly everything else on a boat is something that the average handyman can tackle: bottom paint, varnishing, fiberglass, even basic engine maintenance. But Id always been in awe of canvas makers because it seemed so, well, mystical. Up to this time, my biggest sewing project had been hemming a pair of jeans under my mothers watchful eye, You need to know how to sew because, God knows, no one will marry you! she said. The good news is twofold: she wasnt right (about marriage) and canvas work isnt that difficult, either. Not only did I knock out the weather cloths, but Ive also made a windscoop for a hatch, replaced a seat cushion, and sewed up a pair of duffel bags. I even repaired my favorite canvas briefcase that was coming unstitched. I bought a sailmakers sewing machine. There are a number of different brands available, but I chose a Sailrite (www.sailrite.com) for several reasons. First, Sailrite has been in business for decades and now has a second generation of the Grant family running the show. Second, Ive never heard a bad word about Sailrite machines, and I know a lot of people who have literally cruised around the world with them. Last, Sailrite is really good about support, and their free catalog is a one-stop shop for everything from needles to Sunbrella fabrics. I chose the Sailrite LSZ-1 (about $900) because it offers both straight and zigzag stitching (the $700 LS-1 is straight only). Both have powerful motors and cogged belt drives to prevent slippage and stalling, but the most important feature has proven to be the walking presser foot which grips the fabric and moves even bulky seams past the needle. Ive run 10 layers of coarse fabric, plus a leather reinforcement, under the needle and the machine wasnt even breathing hard. By the way, when referring to canvas work, I dont mean youll be dealing with the stiff canvas that faced sailors in Mutiny on the Bounty. 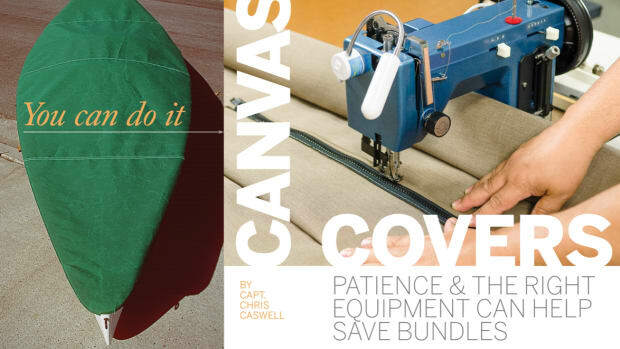 Canvas work is simply the nautical term that refers to nearly anything made of fabric around a boat, even if its a modern synthetic of gossamer weight. My most recent challenge was to build a cover for my 14-foot rowing tender. The starting point for almost any project is to decide on a fabric and, in this case, I chose a green Sunbrella acrylic of about 9 ounces per yard. This is a breathable material to help combat mold, and it is UV, water, and mildew resistant. It doesnt shrink or stretch, and both sides are identical so you dont have to worry about the inside and the outside. For a bimini top, you might want a vinyl-covered material, while awnings are likely to be lightweight nylon. A sun-resistant thread is also required and, for my cover, I chose a V-69 polyester sailmakers thread that used a No. 18 needle, and I had several spare needles in case of breakage. I also picked up The Complete Canvas Workers Guide by Jim Grant of Sailrite and The Big Book of Boat Canvas by Karen S. Lipe. Both are invaluable. Before you begin any project, whether boat cover or bimini top, take a walk around the docks to see how the professionals do it. In the case of boat covers, most are made with athwartship panels so that rain sheds, rather than puddles, on the seams. Since my tender has a sizable gunwale, I decided not to install snaps or other fasteners and, instead, planned to secure it with a drawstring that tightened the canvas under the gunwale. Your starting point is what canvas makers call a blank. Sunbrella comes in 46- or 60-inch widths and my 14-footer would require four 46-inch-wide panels sewed into a blank that covered the boat. Since the tender tapers at both bow and stern, the blank roughly follows that shape. Number the panels in sequence with white chalk (it rubs off later) so you can re-assemble them in order. Big tip: Before you start sewing on the real project, practice on scraps. Learn to control the speed of the sewing machine, practice sewing a straight line, and understand how to use forward and reverse to overstitch the thread at the start or end of a seam. Probably the most important practice is sewing across a seam, especially one from several layers of fabric. Two items will prove invaluable to beginners (and experts, too): Seamstick Basting Tape and a stitch ripper. The double-sided basting tape (from Sailrite) eliminates the need for pins to hold a seam together for sewing. And, when your hand or mind wanders, the ripper will quickly remove any stitching that strayed off course. When the blank was finished, I spread it over the tender and used spring clamps to hold it to the rails while I marked the shape with white chalk. Since I wanted enough material for a wide hem to carry the draw cord, I was generous when I trimmed away the excess fabric with scissors. I also found that I had to make three darts at the bow and one at each corner of the stern so the material wouldnt pucker. Again, the basting tape held the fabric while I stitched the dart and then I cut away the flap underneath. I sewed the drawstring seam with the cord in place to simplify feeding it through later. It was a great plan that worked perfectly right up to the point where I stitched through the cord accidentally and had to rip out about 2 feet of seam. If I were doing it again, Id still put in the cord, but Id sew a lot more carefully. Holding my breath, I took the finished cover and put it on my boat over a couple of wooden bows Id made to hold it up. To my delight and surprise, it fit perfectly without flaws or wrinkles. Of course, the seams are sometimes a bit freeform, but it looks and works great. Through a couple of rainy winters, its kept my boat clean and dry. My cost was about $75 for 5 yards of Sunbrella, $13 for a cone of thread, and about $8 for 60 yards of Seamstick that should last forever. In that one project, I paid for the sewing machine. Frankly, I cant imagine not having a sailmakers sewing machine, and especially if you plan to go cruising. Youll find dozens of needs, from windlass covers to instrument panel covers to a bag for stowing the outboard in the lazarette. Just dont tell my mom that I can sew.